Coconut Aminos is a delicious sauce made from coconut sap. It is dark, rich, salty and slightly sweet in flavor. It resembles a light soy sauce or tamari (wheat free soy sauce), but Coconut aminos are gluten-free, non-GMO, certified organic, soy-free, MSG-free, kosher and vegan. 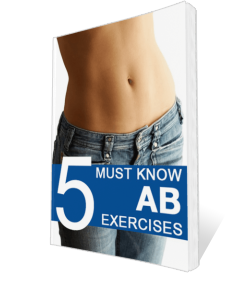 It is high in amino acids, containing 17 different types. Amino acids are the building blocks of protein, and are essential to our health and nutrition. Use coconut aminos in place of soy sauce in cooked foods, salad dressings, or for dipping things like sushi. ​Teriyaki is traditionally a sweet sauce that is made with refined sugars or corn syrup, sneaky ingredients that contribute to obesity and disease. It has a very pleasing flavor, with a wonderful balance of savory and sweet, and so it’s easy to consume a surprising amount of sugar grams when enjoying a meal flavored with teriyaki. In this recipe we are making a healthier, low sugar version of teriyaki. 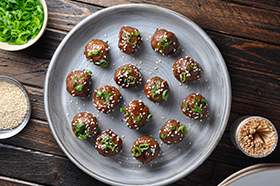 If you are a lover of teriyaki then these subtly sweet meatballs are right up your alley! The recipe calls for a small amount of honey, however, feel free to use liquid stevia rather than the honey if you are looking for an extremely low sugar dish. For most of us, this small amount of healthful, raw honey is perfectly A-OK and beneficial. Serve these tasty meatballs up as an appetizer or serve over arugula or spaghetti squash for a small, fitness-minded meal. Enjoy! One serving equals: 189 calories, 7g fat, 6g carbohydrate, 2g sugar, 372mg sodium, 3g fiber, and 23g protein.